What an honor. Thank you so much. All of the semi-finalists are amazing paper crafters. I am so honored to be among all of you. Good luck to everyone! Please vote for me as a finalist for this amazing adventure in paper crafting ! If you cant reach the voting by the above link, please go to http://www.heartfeltcreations.us. Click on the “blog” and look for the March 22nd post. There you will find the original link to the semi-finalist voting page. 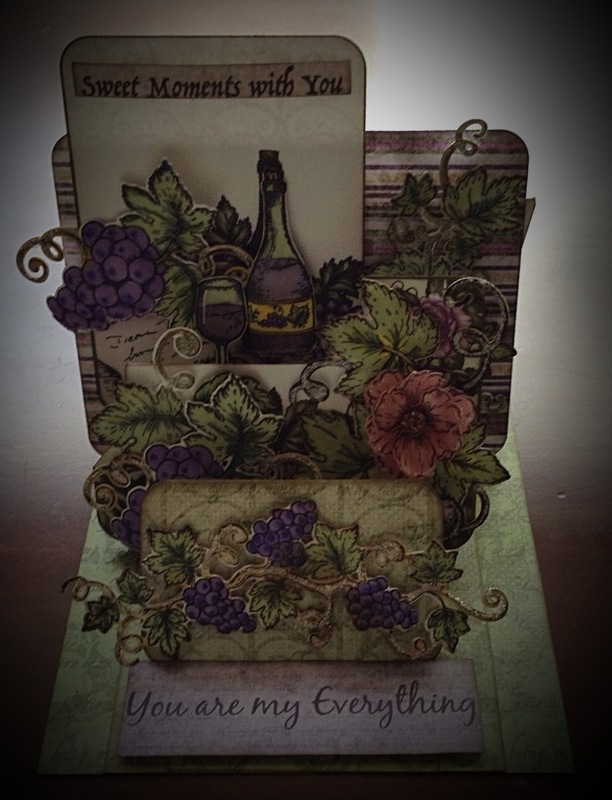 This card is a fun way to use all of those left over scrap papers and flowers. I used a white 7 1/2 x 5 1/2 card base. I layered a piece of chocolate brown card stock that was 7 1/2 x 5 1/2 on top of the front. 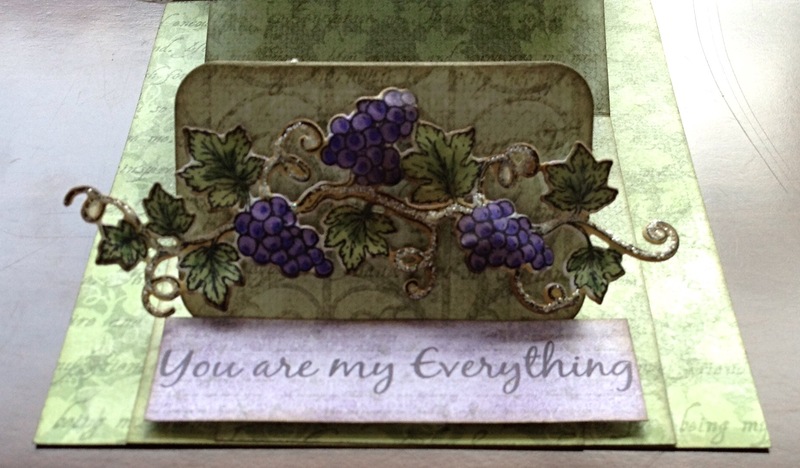 For my gate, I used a left over piece of Vintage Floret paper from Heartfelt Creations. I cut 8 strips that each measured 3/4″ x 7 1/2″. The back of the gate uses 7 strips. I attached the strips to the front of my card leaving a little space between each “board”. The chocolate card stock really gives some depth to this card from between the strips. The 8th strip is for the diagonal piece. I laid it down under the cross boards to eyeball the placement before adding my adhesive. I applied the top and bottom boards and then cut off the extra from the diagonal board. The top and bottom pieces for the gate measure 3/4″ x 5 1/2″. I inked all of the edges with a Walnut Stain distress ink by Tim Holtz. 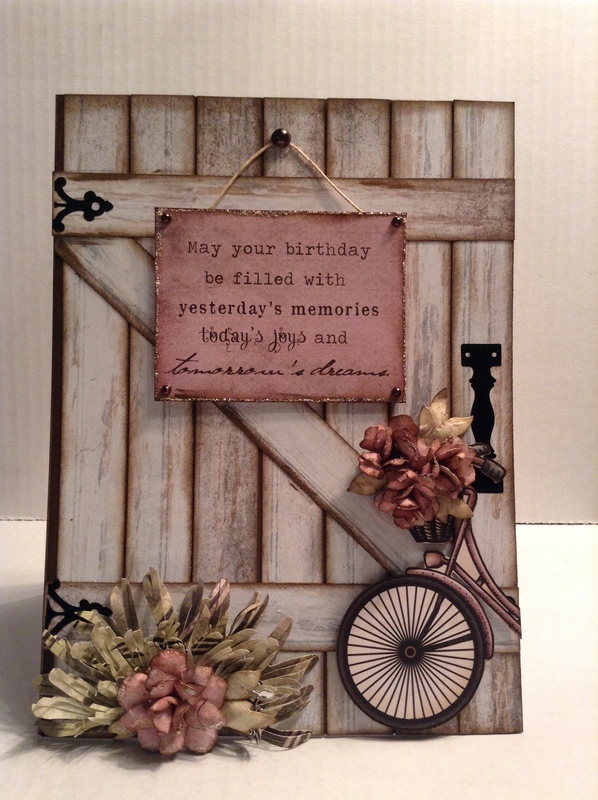 The bicycle and sentiment sign are from the Celebrate the Journey Collection by Heartfelt Creations. I cut out the bicycle and attached it with foam squares. 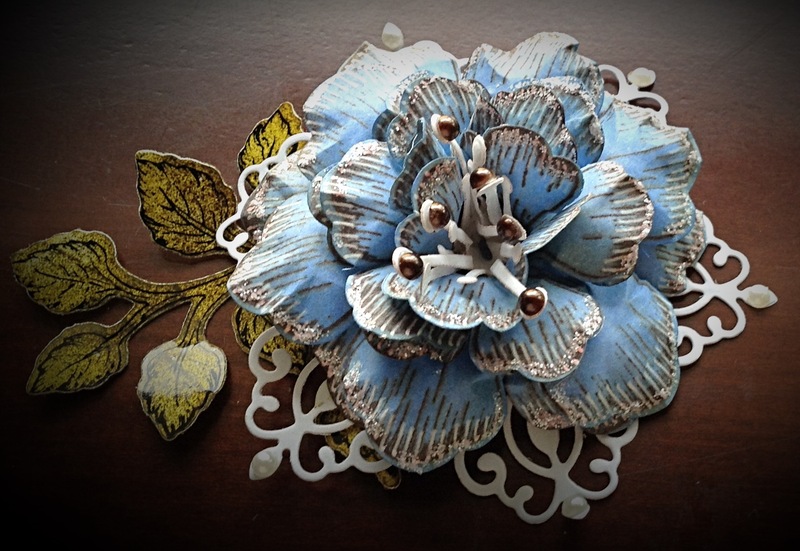 The flowers are made from the small Vintage Floret stamps and dies. I used scraps of the patterned paper to make these flowers. The rose color of the sentiment matches the flowers perfectly that way. For the shrub at the bottom of the gate, I used the Enchanted Mum die by Heartfelt Creations. I used 1 large Mum and 1 medium Mum in a dark green and 1 of each in a lighter green. I cut the Mum in half and then cut each petal into smaller strips to give it a grass-like texture. I alternated the layers between dark and light with the large Mum in the back and the medium Mum in the front. I completed the shrub with a small Vintage Floret. I attached the sentiment sign to the gate with craft foam and twine. I embellished with chocolate brown gems and glitter. The gate hardware is from Dazzles-Hardware. I hope you make this and share it with someone who needs a little sunshine! It’s been a while since I have posted. The past year has been a little crazy. You don’t appreciate your crafting supplies/tools/therapy (you all know what I am talking about) until they are being stored in a pod for a year! 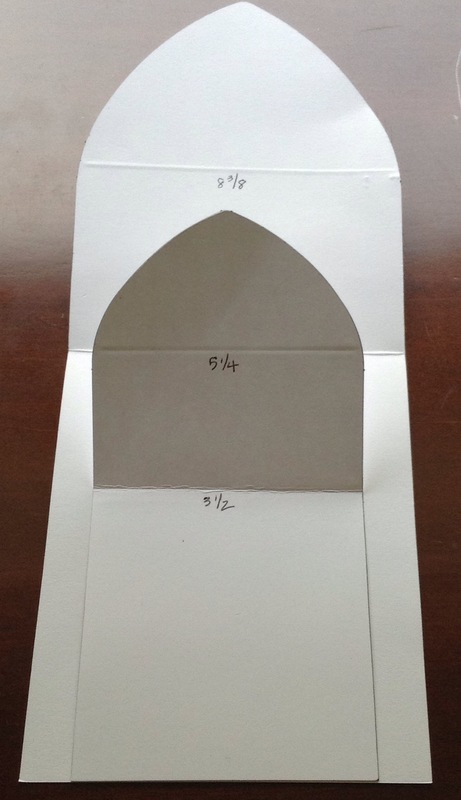 This fun tri-level card can fold flat for mailing and can be altered for any different fun shapes and holidays. You will need paper(I like to use double sided 12 x 12 paper ), a scoreboard, adhesive, stamps, dies, alcohol markers, glitter, flower shaping kit and your amazing creative talent. Cut your large strip to measure 11 x 4 1/2″: lay horizontally(long side) on your scoreboard and score at 5 5/8 and 8 3/8. Cut the right end at the 8 3/8 score line to the center of the right edge at 11″ mark. The right end should now look like an envelope flap. Fold score lines. Cut your medium strip to measure 7 x 3 3/8″: score on long side at 3 1/2 and 5 1/4. Cut the right end at the 5 1/4 score line to the center of the right edge at 7″ mark. The right end should now look like an envelope flap. Fold score lines. Cut your small strip to measure 4 1/2 x 2 1/4″: score long side at 2 1/4 and 3 3/8. Cut right side to make envelope flap. 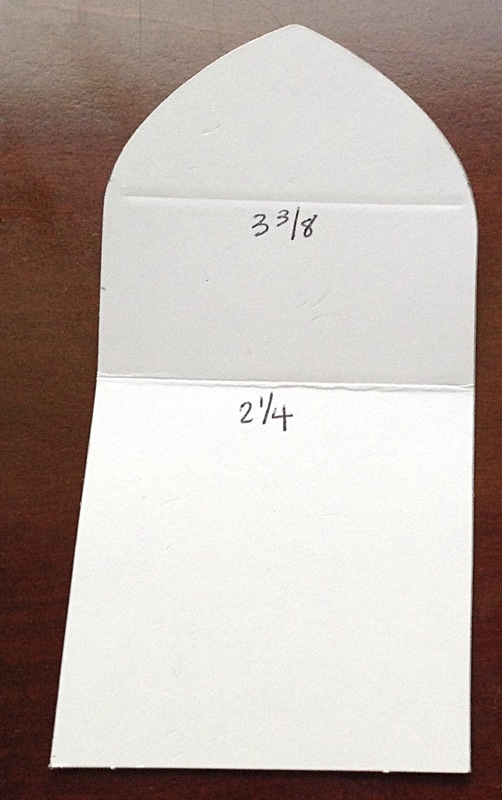 Cut 3 sizes of the same shape. 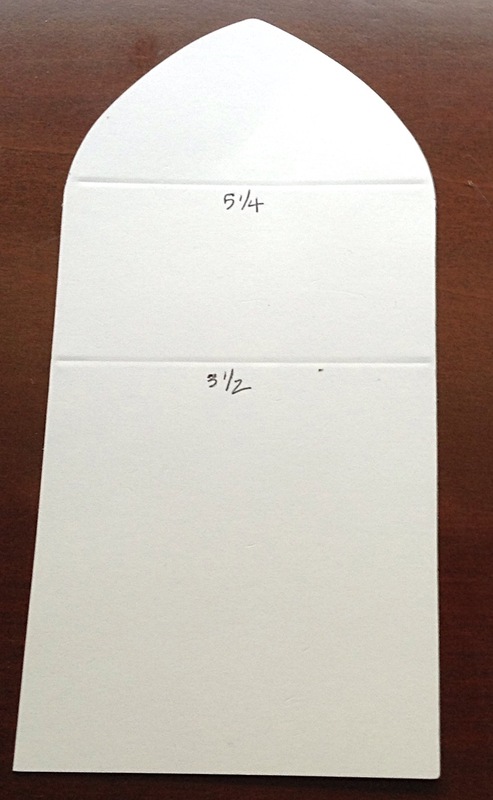 Large shape should roughly be 4 1/2 x 4 1/2″. Medium roughly 3 1/2 x 3 1/2″. Small roughly 2 3/4 x 2 3/4. 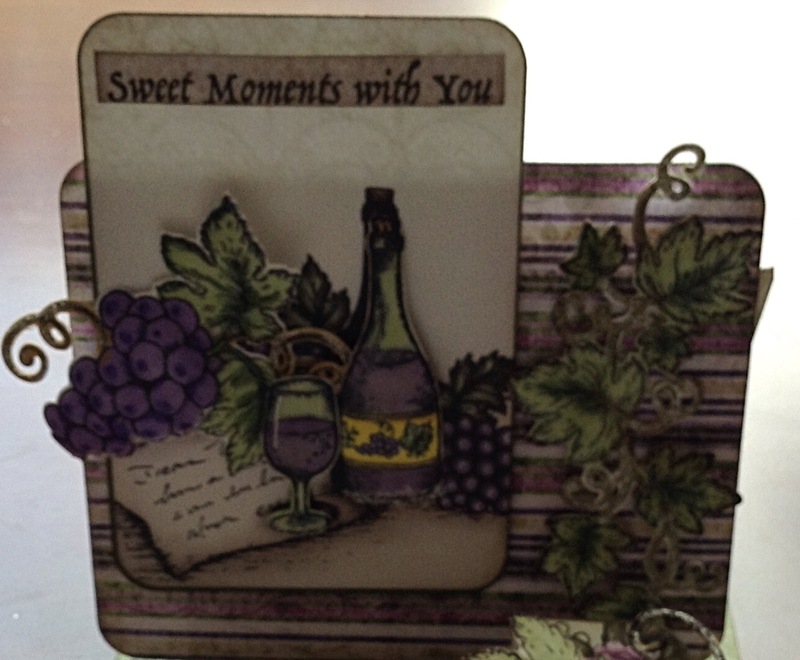 I used the rectangles from Heartfelt Creations Cut Mat Create 1A. I love to use hearts for Valentine’s Day too. I decorated my 3 shapes first so they could dry while I constructed the base of the card. 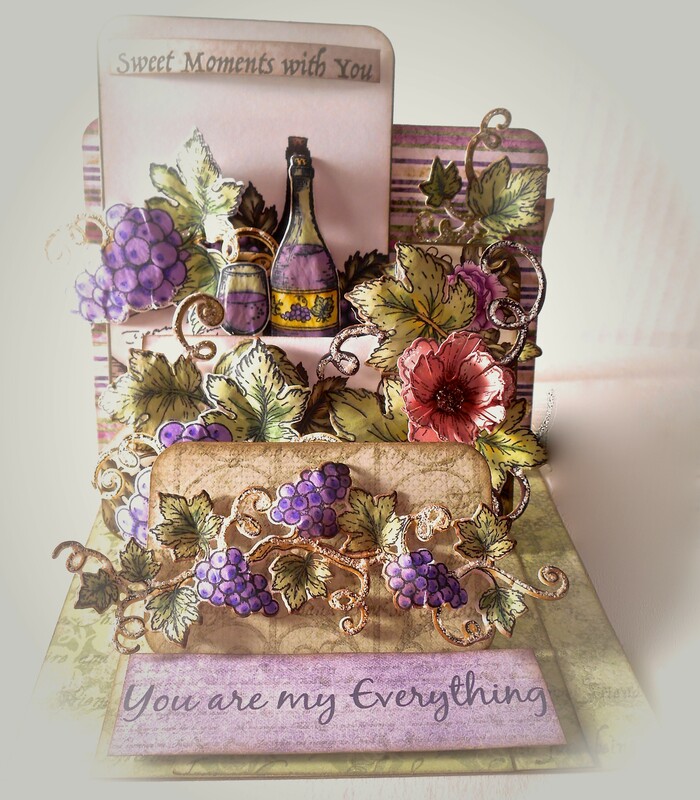 For the largest panel, I layered images and panels from the Italiana Riviera Paper Collection from Heartfelt Creations. 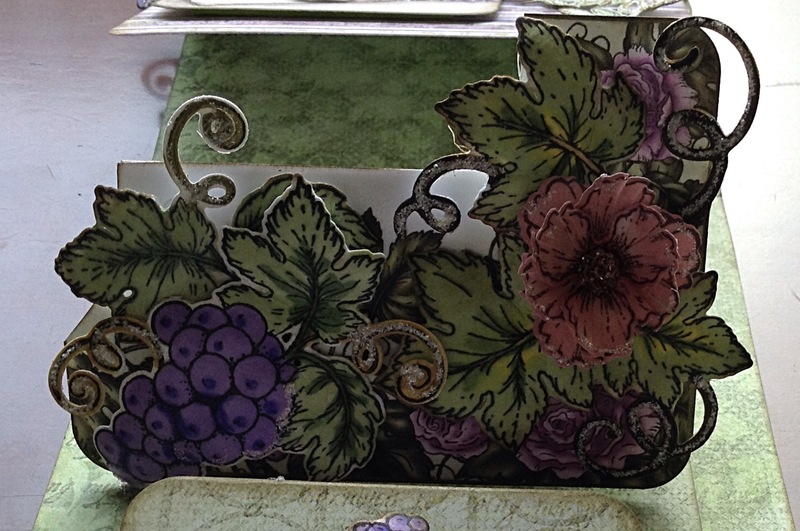 For the medium and small rectangles, I used the stamps and dies from the Italiana Grapevines and the Italiana Grape Clusters sets. I colored them using my alcohol markers and embellished with a little glitter. I added a pink Blazing Poppy to the medium rectangle. 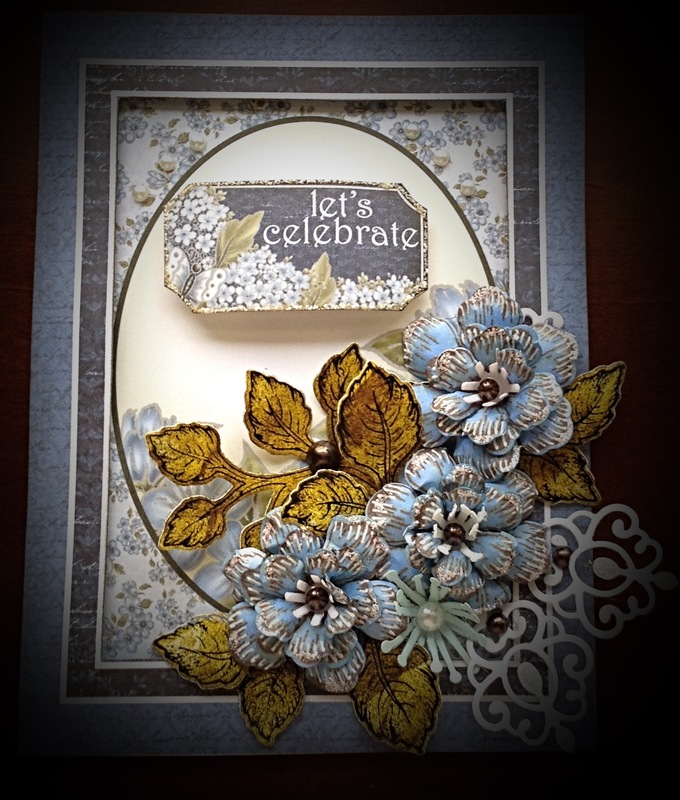 These stamps and dies are a great staple to any paper crafter’s collection. To assemble the base of the card, we are going to layer the three strips one on top of the other. Lay the large strip down first with the largest section(measure 5 5/8) flat on the table and the envelope flap end pointing up. Next, take the medium strip and center the base over the large strips base. Attach adhesive to the back of the medium strip (only on the end that measures 3 1/2 “) and attach to the middle of the lower edge of the large strip. Do the same with the small strip. 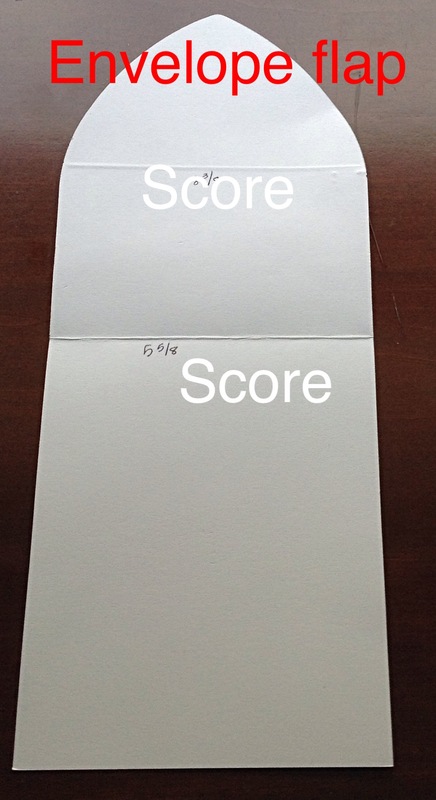 I used white paper in the demo pictures so it is easier to see the score lines and the placement of the papers. 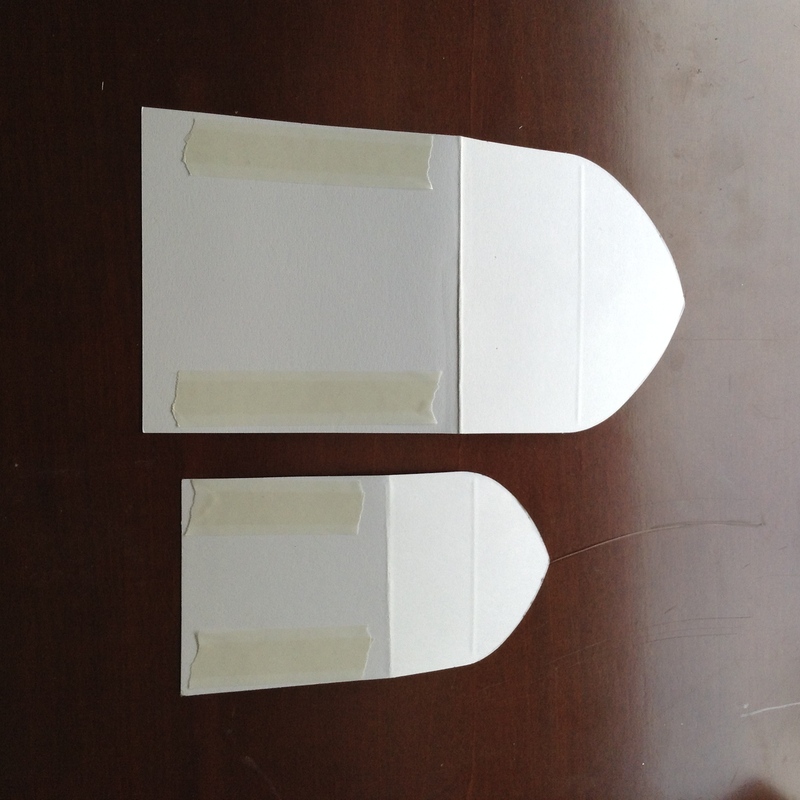 Fold down the envelope flap ends and apply adhesive. 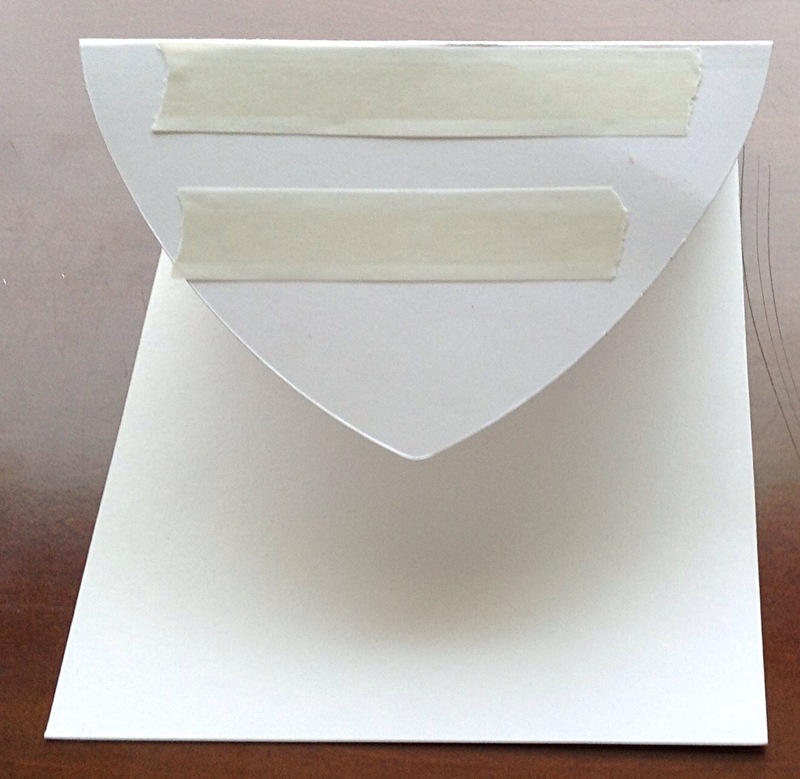 Attach decorative pieces to the envelope flap ends. 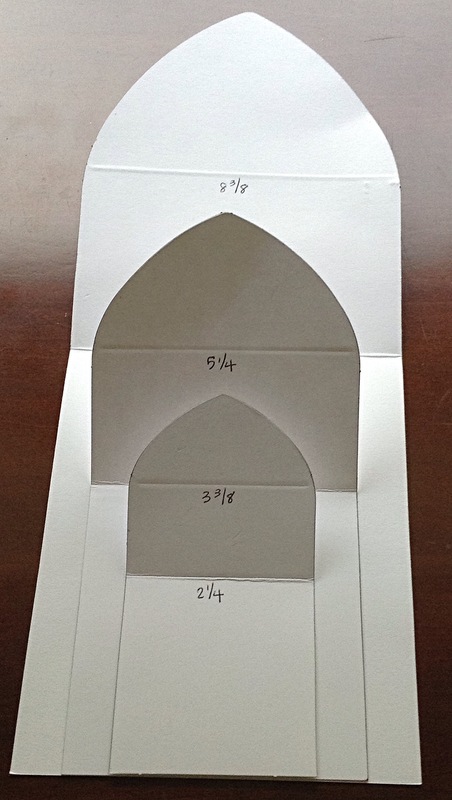 Make sure all of the envelope flap is covered with your shape. The smallest shape stands up behind a banner. I used a 3 x 3/4″ banner popped up with foam squares. The sentiment is part of the paper collection. All of your layers can lay flat to be mailed. If you don’t have too many pop up embellishments, 1 stamp will be fine. I hope you enjoyed this project. Please make one and share your sunshine with others!